Back in February of last year I attended the Mac 'N Cheese Affair hosted by the Campus Food Bank. To my surprise I had won a Chef's Table tasting from Earls. I had completely forgotten about it 'til recently, and had the chance to stop by last week with a group of friends. Upon arrival we were all promptly seated and offered drinks before the fun began. I had no idea what to expect from the Chef's Table experience, but I imagined that it would be a night of good eats possibly off the menu. Throughout the night we were served multiple courses of different dishes from their regular menu - oops, I was wrong! 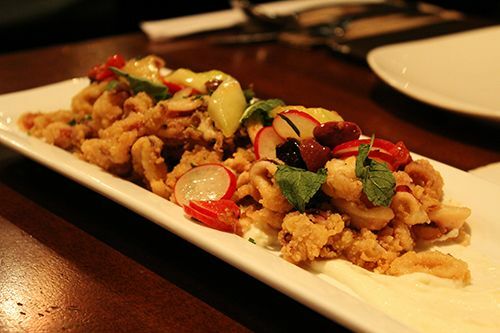 Our first course was actually new to the menu - the Mediterranean Calamari ($13): cucumber, spanish olives, greek citrus yogurt. A generous portion of crispy calamari sat on the plate, and the oil was cut by the fresh vegetables and herbs mixed in. 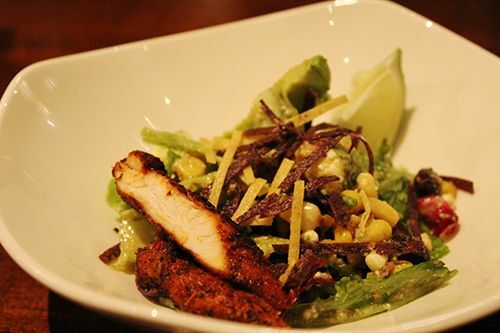 Next up we had a taster size of the Santa Fe Chicken Salad ($16.50 reg): avocado, black beans, corn, dates, feta and field greens, peanut lime vinaigrette, crispy tortillas, cajun spiced chicken. I loved all the different textural components of the salad and the creamy dressing really brought it all together. It was a tangy salad with well seasoned, moist chicken. I totally want to recreate it at home! To give our teeth a break from chewing, our server brought out mini raspberry mojitos for us all to try before serving the next course. 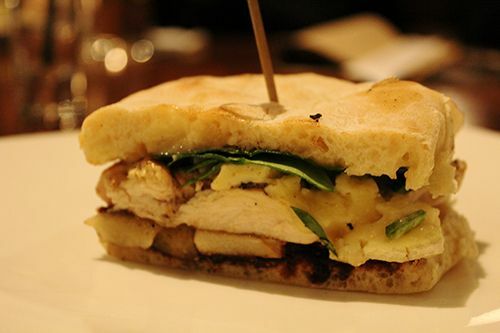 The Chicken, Brie & Fig Sandwich ($14) was the next to our table, and it's one of the most popular sandwiches Earls has: roasted apples, spinach, sweet fig jam, garlic mayonnaise, house baked ciabatta. I know some people will look at this combination and think it's a little strange, but it really works well together! The gooey, melted brie pairs wonderfully with the sweet apples & fig jam and tastes delicious with the moist roast chicken. After devouring the sandwich our server came to the table asking if anyone wanted to be the chef in the kitchen. I happily volunteered and was handed an apron. 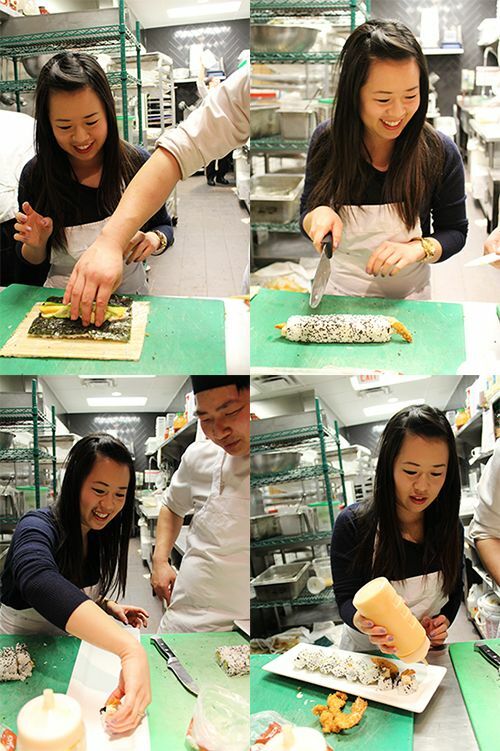 Unbeknownst to me, one of the perks of the Chef's Table is a chance to make sushi with the cooks in the kitchen! I donned my apron and headed into the kitchen to make a Dynamite Prawn & Mango Roll. Through a step by step demonstration, I think I did a pretty good job! At least none of my friends got food poisoning, so I think it's safe to say that I get an A+. It was so fun to play in the kitchen environment! Take a peek at these videos here & here if you're curious as to how it went down! 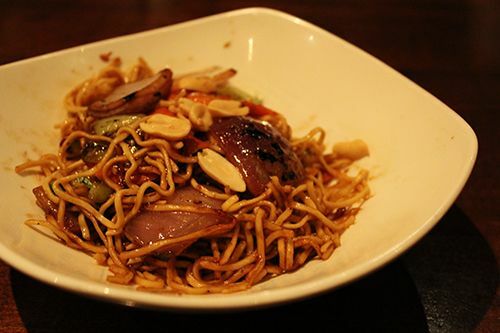 Continuing with the Asian theme, next to our table was the Hunan Kung Pao ($13.50): spicy ginger soy sauce with wok fried noodles and seared vegetables, topped with peanuts, customize spice by adding 1-6 hunan peppers. This unfortunately was my least favourite dish for the night, as the noodles were quite soggy and coated in a thick, sticky sauce. The sauce itself did remind me of a lot of Asian cuisine, with flavour similar to Chinkiang Vinegar, but this isn't a dish I would see myself eating again. The last savoury course for the evening was a sampler of the Braised BBQ Back Ribs and Blackened Cajun Chicken. The two were served with a side of coleslaw and warm potato salad. I'm not a huge fan of BBQ sauce to begin with, and found this one to be on the smokier side. 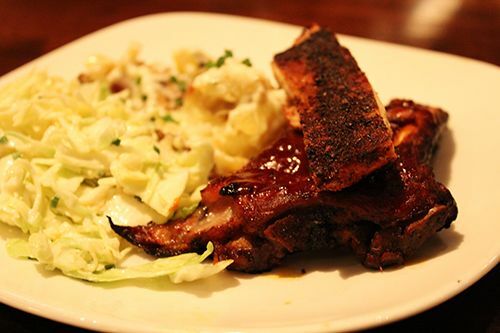 The ribs however were tender and moist, making everyone at the table happy. The chicken was moist with a delectable crust on it, and it reminded me of the chicken in the Santa Fe Salad we had earlier. At the end of the meal we were all nearly too stuffed to even think about dessert, but I wanted it anyway. Our first dessert was the Warm Chocolate Banana Cake ($8): caramelized bananas, banana creme anglaise, caramel walnut gelato, which I really enjoyed as it wasn't too sweet. 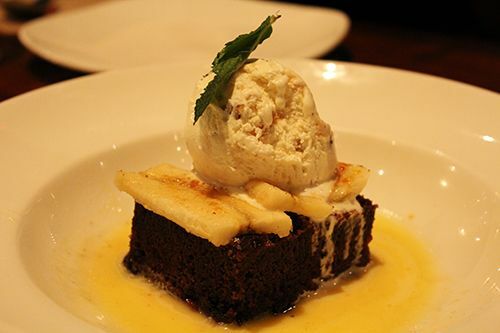 Banana and chocolate always go well together and the creamy gelato on the top was a great addition to the dish. 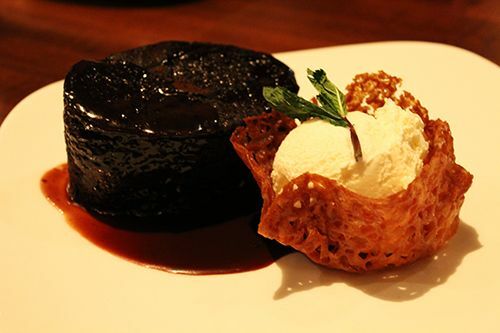 The last dish of the evening was the Chocolate Sticky Toffee Pudding ($8): warm rich chocolate cake, chocolate and toffee sauces, vanilla bean gelato. Of the two desserts this one was sweeter and richer. However, I loved the vanilla bean gelato served in the caramelized cookie nest, and could almost say that was my favourite part of this dessert! So after multiple courses and lots of fun in between, the Chef's Table experience was definitely memorable. We all felt well taken care of and our server was wonderful. If you ever have the chance to join in on a Chef's Table experience, I highly recommend it! As Earls can be found throughout Canada and in some parts of the USA, hopefully a location near you offers it! What an honor Andrea!!! I know you were tickled pink. First, just to be at the Chef's table is FABULOUS. I can't get over all of the dishes they served you guys. So delish! 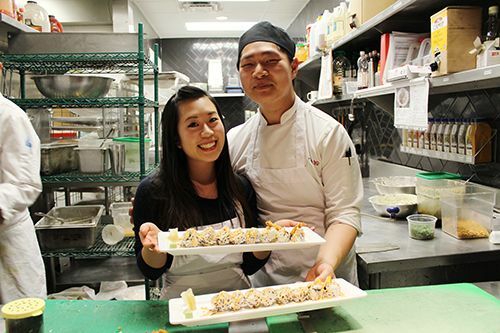 Then you got to go behind the scenes in the kitchen and prepare a wonderful sushi dish. You did an amazing job! 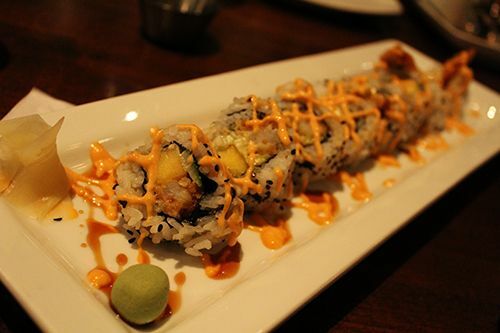 It looked really good! 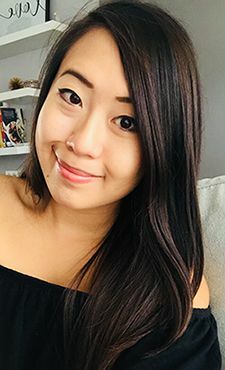 Very happy for you! Have you Eaten a Ford Lately?